I obtained a copy of both books from my local public library. Ants and beetles, and termites and slugs and ticks and cockroaches! Oh, my! Just in time for summer, Creative Company have added six new animals to their Creepy Creatures series: Ticks, Termites, Ants, Slugs, Cockroaches, and Beetles. I looked at Ticks and Cockroaches. This series provides readers with a overview of those insects that children are always curious about. Each book is 24 pages in length with lots of close-up color photos that children love to pore over. The information is relayed using simple language, one or two sentences per page. Perfect for young listeners. Scientific words are set off in bold and then written out phonetically. You are walking in the woods on a summer day. Suddenly, you see a brown dot on your arm. You look closer. It's a tick! 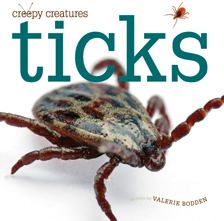 Ticks are arachnids (un-RAK-nidz) They have two body parts and eight legs. The books are handy because they offer a very basic introduction to each animal such as where they live, what they eat, how they grow, and any unique traits to help define them. Did you know cockroaches can hold their breath? That's why you see them in your sink; they climb up your drainpipe! The books have a table of contents, bibliography of books and web sites for more information, and an index. To round out the experience, each title includes an activity that emphasizes the animals physical characteristic. You can take a peek inside the books in the series by visiting Creative Company's web site. 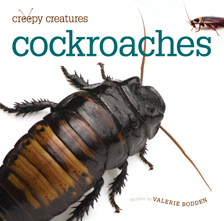 I have so many preschoolers always wanting books with pictures of insects. This set will fill that need. My son would love these books. He loves all things creepy crawly! I love your book suggestions. I don't necessarily love cockroaches or ticks. ;) I've been a lurker for some time reading your reviews but I just joined your site via Google Connect so that I can follow more closely. :) Thanks for sharing!